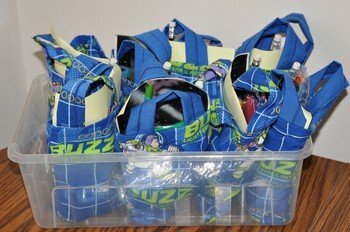 ~To make a taller bag use 4 strips with 24- 4 ½ x 4 ½ inch squares. 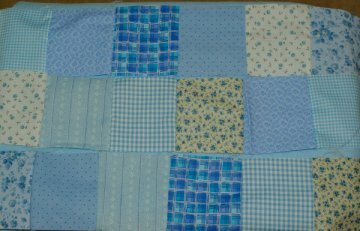 Cut your ¼ yard of fabric in 4 ½ x 4 ½ inch squares. Arrange your different squares as you'd like them to be laid out. Sew 6 squares together to make one strip by sewing one end to the next, to the next, etc. 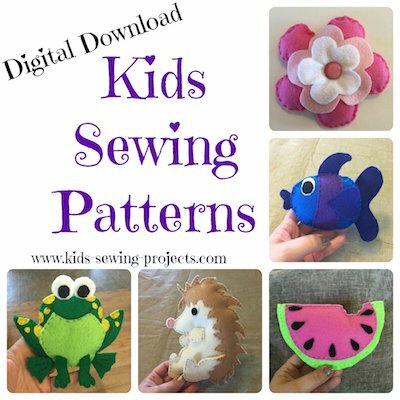 Sew them with the right sides together. Make 3 strips of 6 squares. Once your 3 strips are done lay them out again the way you'd like it. Pin together Row 1 to Row 2, right sides together, matching squares up. Sew together taking out pins as you go. Continue with Row 3. Now you have a rectangle, fold in half right sides together. Measure, if your rectangle is smaller than 13 inches, cut lining pieces to equal size of outside bag. 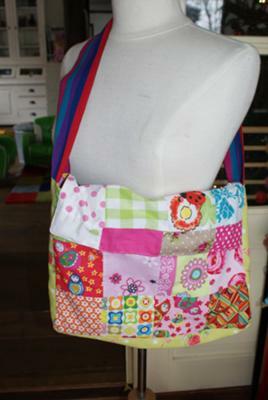 Sew side and bottom together of patchwork tote. Use your presser foot guide to keep an even straight line. To make lining, take 2 pieces of lining material and put them right sides together. 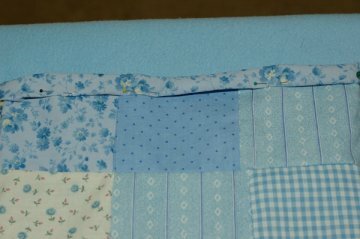 Sew along edges leaving top open. Leave inside out. 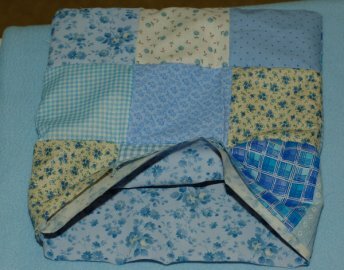 Turn the outside of the tote so that the right sides are facing out. Insert bags into each other so wrong sides are together. On the top edge turn 1/4 inch down and 1/4 inch again. Pin in place. 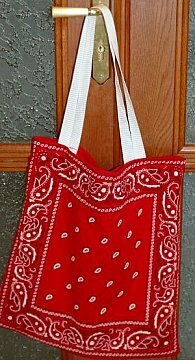 ***We pinned our bag with the lining showing out, just for fun, or you can fold it inside also. Make straps by taking your 2 1/2 x 13 1/2 inch material and place them right sides together. Sew along long edge. Turn inside out. Attach handles to middle of front and back. 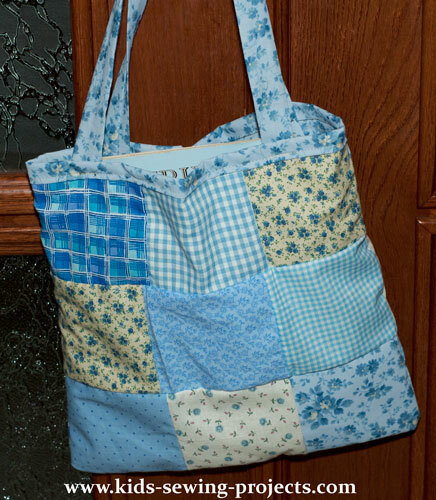 Using all little squares of fabric (10x10cm), you can easily make the nicest patchwork tote bag from any pattern available. My 7 year old daughter made this bag and it is now already her favorite. 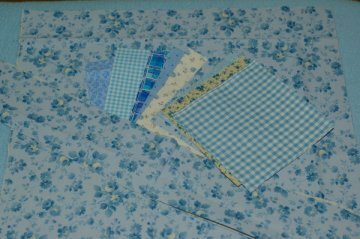 4- Make the same bag from plain fabric (front of the size of 3x4sq, back of size of 5x4sq and the sides/bottom). 5- Fit the bags into each other with the nice sides facing together on the inside. 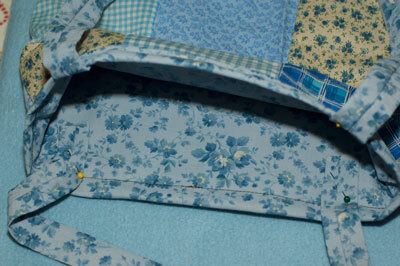 9- If you like you can add buttons to the closure or just leave it as it is. 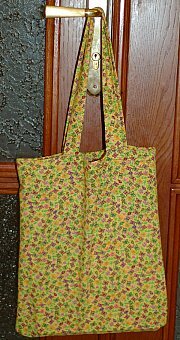 For a tote bag without a lining see these sew a tote bag instructions. 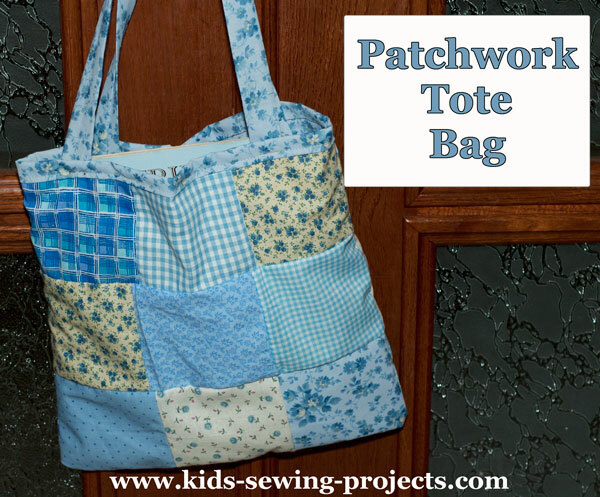 On to more kids sewing projects from Patchwork Tote Bag.